Walk On Washington highlights the many art galleries, restaurants, boutique businesses, and entrepreneurs that serve this hidden historical and culturally diverse neighborhood along the Washington Blvd business corridor of Arlington Heights, Angelus Vista and Western Heights between Bronson Ave. and Wilton Pl. 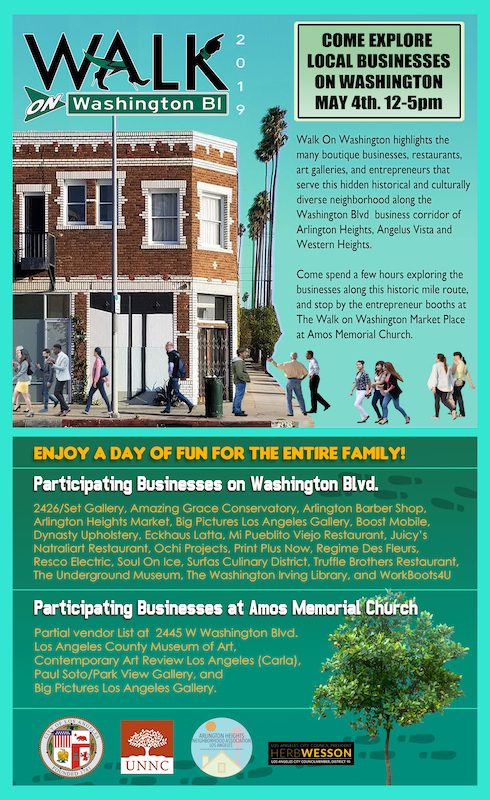 Come spend a few hours exploring the businesses along this historic mile route, and stop by the entrepreneur booths at the Walk on Washington Market Place in the parking lot of Amos Memorial Church. Enjoy a day of fun for the entire family!